Do you remember Bambi? For most, this charming animation will forever be an adorable representation of deer. However, when a herd of deer flock into your garden bed at night and you discover the next morning they have eaten your flowers and destroyed your newly planted trees, you might think differently. Why do deer rub their antlers? For some, the damage caused by deer can be a frustrating experience. The damage is especially dangerous for your young trees. It is important to know that this type of behavior is natural and we encourage you to remember that it is one of the few downsides to living among with wildlife. Male deer, or bucks, scrape their antlers along the bark of trees to shed the velvety fur off of their antlers. 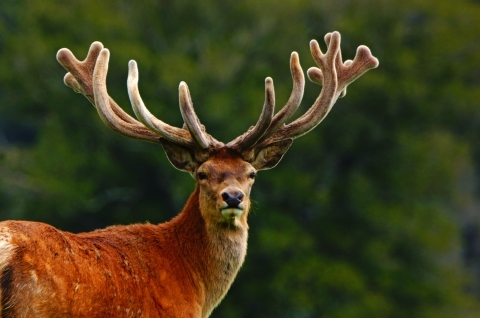 This lets the deer show off their rack in all their pride and glory. This doesn’t mean good news for your saplings though. Not only does this strip your new tree of its protective bark, it brings an unpleasant aesthetic deterioration. When the bark is taken off your tree, it is suddenly more susceptible to disease, pests, freezing, and other harm. Ultimately, this vulnerable exposure can also mean that your sapling will most likely starve as well. So, while the rubbing instinct to the deer is perfectly normal and natural, it threatens the livelihood of the tree in the end. This cycle of nature can be annoying for homeowners and business owners. The good news is, our tree care experts can offer you a solution to this problem. As a rule of thumb, know that some damage is unrepairable for your sapling. If the deer have completely ripped off the outer protective bark around your tree, it will likely die. For small sections of damage though, there is still hope. Bucks are incredibly strong and incredibly determined creatures, so many anti-deer sprays will not deter young bucks from these natural instincts. The only sure way to stop initial or continued damage to your trees is to install a tall, wire fence around the circumference of your sapling. The kind of installation is best performed by a tree care professional as they can better determine how far away to place the wire fence to keep bucks out and still allow for space for your tree to grow. If you need to protect a group of trees, there are also plastic trunk wraps and rubber tubing solutions available. This type of material is proven effective against antler penetration. Growing Earth Tree Care is here to offer you relief and comfort in knowing how to proactively save your trees from inevitable deer damage. Reach out to us to speak to our certified arborists about your options today!